The Progressive Gazette: Vlad the Crusader - Satire! With the world reeling over Vladimir Putin's recent openly confessed Christian Orthodoxy, his caustic remarks about the West's sad "decadence", and his assertions that Russia has an ancient Christian claim to the Ukraine, scholars, journalists, and theologians, are scrambling to make sense of it all. Here is a sampling of critical remarks. Zbigniew Brzezinski: "Listen, I'm an insider, so it's really not fair to question me. The game works better if you all stumble around blindly and bump into things by accident. But since you asked, ins't the fact that the global narrative has been inverted so dramatically a sign, in and of itself?" Pravda: "Our glorious and fearless leader is above reproach. The West is a sink hole. 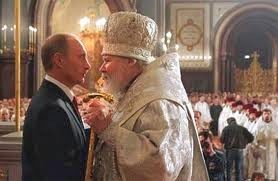 We are now Holy, ever since our beloved Vlad started going to Church. Now we must make the whole world feel the same way. Calling all crusaders! Come to Russia! She is the new Jerusalem. Oh, and West is a Sodom. Ew. Yuck." The Imam of Iraq: "Technically, I could care less, except that these things generally spill over onto my back yard, and then my people start blowing things up. It's a lose-lose situation, really." Barack Obama: "Decadent? Are we decadent? I don't think so. You know, I was down at Planned Parenthood the other day, and this lab tech rescued a kitten from a tree. It brought tears to my eyes. I thought: America, you're going to be all right."